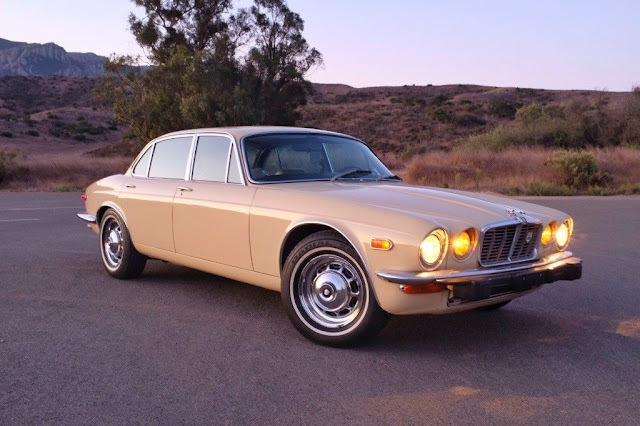 The series 2 Jaguar XJ was updated from the series 1 in 1974 with the blessing of Jaguar's founder Sir William Lyons who is quoted as calling the XJ "the finest Jaguar ever made." Of course Sr William would be rolling around in his grave (he is dead right...would be embarrassing if he was cruising around Nottingham eating steak and kidney pie...or whatever) if he knew this thing was powered by a cast iron lump of push rod equipped 'Murican arhn. 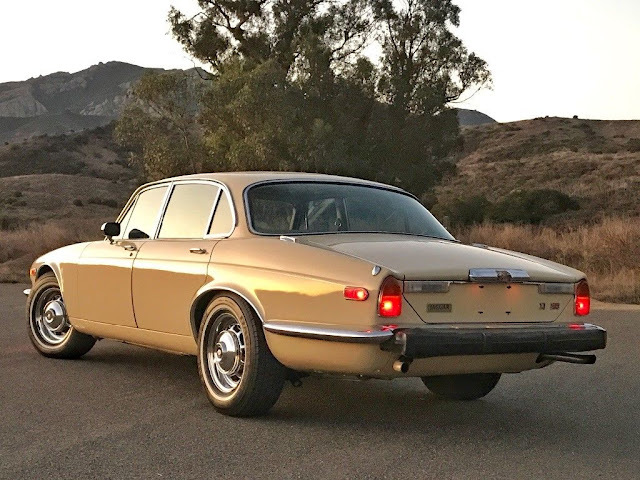 Find this 1974 Jaguar XJ12 V8 here on eBay bidding for $5,000 with 3 days to go located in Moorpark, CA. Seller submission from Dan. This beautiful touring car is an absolute pleasure to drive and is in fantastic condition. Turns heads everywhere it goes. 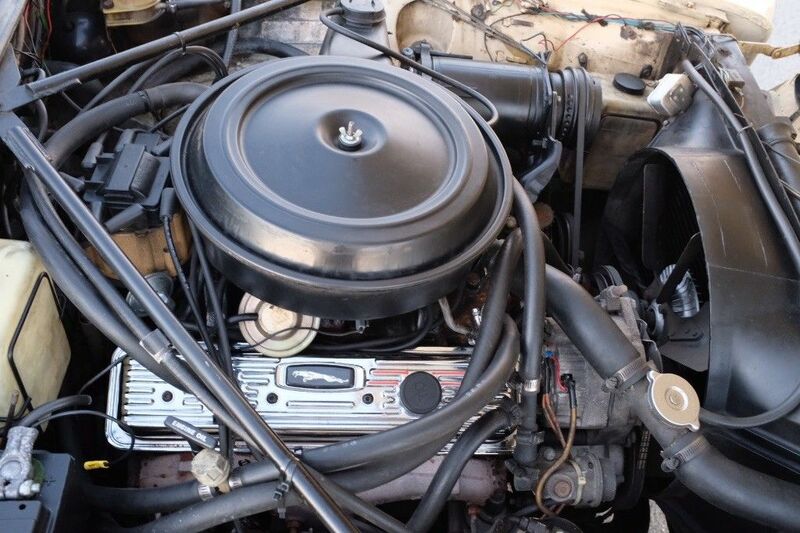 1974 Jaguar XJ12, which has been repowered with a smooth, reliable and powerful chevy 350 crate motor. Zero rust, no accidents, body and pans are perfect. One repaint, extremely high quality and in gorgeous near flawless condition (a few tiny rock chips on the front). Original leather interior is beautiful, very soft with no flaws - perfect condition. Original wood is stunning, no cracks. Carpet is perfect and it has brand new custom made Berber carpet floor mats. Trunk is perfect, new fully lined carpet kit. The air conditioning blows cold and works great, factory options including power windows, power door locks, cruise control all work perfectly. All gauges and switches work. No issues. Dual fuel tanks, both work great. Newish tires with almost zero wear. Suspension recently greased and brakes inspected. Car handles great and rides like a dream - drives like a modern car not a classic, it's actually quite impressive. Wonderful driving car with all the rewards of a classic English sports saloon but the reliability and power of a professionally installed stock small block chevy. Handles like a new car. Got your own ride to sell? Check out DT's submission page here. A turd in perfect condition is still a turd. Have you no heart, sir? I mean, the A/C WORKS!! Well, at least they got rid of the unreliable and maintenance intensive V-12! I'm in the "pro" camp, as well. When our robot overlords have taken over and our personal conveyances are anonymous sentient bubbles, we will pine for this. 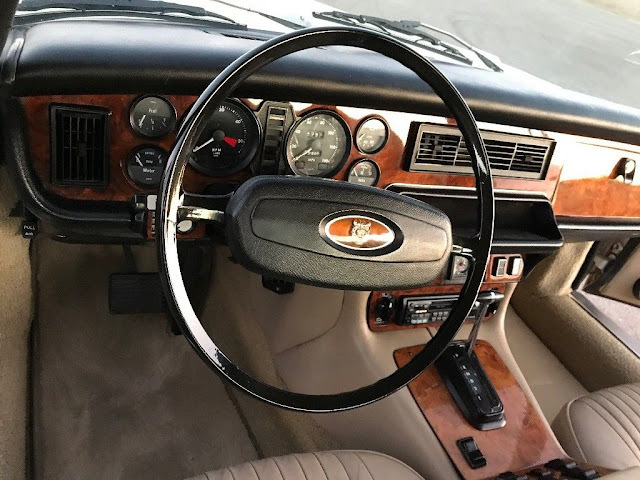 I find myself in the pro camp as well, even though I think the price could be bargained down just a bit (and, I have some nits to pick about the refinishing job on the steering wheel and the carpets). These make so much sense because once the V12 is wrestled free (taking care to not mess up the GM Frigidaire A/C unit and [I believe the GM power steering pump])the GM V8 bolts up beautifully to the GM transmission. Given that the ancient electronics are still functioning for the windows, and door locks, these are vault quiet for long highway rides. The real beauty of the swap is not fearing ambient air temperatures over 80-degrees. Finished at $7,600. I definitely like it.